Before you go running off to the Apple store, you may want to educate yourself. 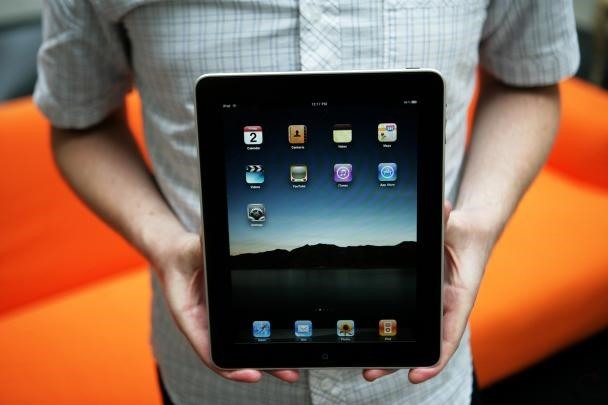 DVICE is kind enough to compile the 20 biggest complaints about the iPad from a whole slew of reviewers. 1. Upscaling makes old iPhone/iPod Touch apps ugly. 2. No GPS for the Wi-Fi iPad. 3. Apple's oleophobic coating doesn't get rid of distracting fingerprints. 4. The screen is unreadable in direct sunlight. 5. Missing USB port and SD card slot come as separate $30 adapters. 6. The virtual keyboard still doesn't beat a physical one. 7. YouTube looks ugly on the big screen. 8. Even at 1.5 pounds, the iPad feels heavy to hold. 9. Charging the iPad via USB on a PC has been shaky at best. 10. The headphone jack up top is awkward. 11. The Home button gets in the way while holding the iPad horizontally. 12. Some Apps have been found to be unstable. 13. The battery is not replaceable. 14. The iBookstore only works with the iPad. 15. App Store layout feels unwieldy compared to its predecessors. 16. Built-in Mail falls short compared to fully featured computer email. 17. The iPad lacks a proper filing system. 18. The HD apps are expensive. 19. Pages ($10 word processor) doesn't work with professional standards. 20. The iPad is for consuming, not creating. Previously, Zealot Vandalizes Own Car To Install iPad. iPad Jailbroken Within 24 Hours of Release. MEET THE iPAD: Get All Your Latest Apple iPad News Now. Definitely pointless to buy iBooks. Just download the Kindle App, then you can read your books on an iPad, iPhone, Mac, PC, or Kindle. And they all sync wirelessly. Oh, and they're cheaper. iBooks is pretty, but very closed / limited. I disagree with youtube, I think the ipad youtube experience is fantastic. My 3 year old son can browse rollercoaster videos with an ease and beauty not possible on a laptop or desktop computer. I agree for the most part and including the wifi connection problems I returned mine yesterday for a full refund. Might want to delete (or change) #14 iBook will be available to the iPhone. And #20 is not really a complaint. It's not designed to create, it's designed to do. So what? being a linux person i am very impressed with the ipad. i just wonder if i can make it a dual boot system?